One of my all time favorite Indonesian dishes happens to be one that is served only when night falls and one that can cause major artery clogs. I’ve known it my whole life as martabak manis as it is commonly known in Jakarta, but in Bali it goes by the name terang bulan—it took me four months to discover that both names refer to the same exact dish. It can easily be found in one of the vendors that line the streets at night, in seemingly every corner. The hub of vendors closest to my house is modestly sized and serves a decent variety of foods that’s just enough to satiate the neighborhood’s cravings without encouraging people to loiter the night away smoking cigarettes (this is the typical place to do just that in cities). Most of these vendors will serve one or more dishes from the 40 that Indonesians can’t live without. In Bali, you will always find terang bulan in the same stall that offers martabak telor. These two dishes are wildly different from each other, and yet are always sold side by side. Terang bulan is a sweet, rich pancake-like dish with toppings that you can pick and choose from a selection: chocolate, cheese, coarsely ground peanuts, sesame seeds, and even bananas. I always go for the chocolate, cheese, and peanut combination, which is known as komplit, or the “complete”, in Jakarta. On the other hand, martabak telor is more like a thin crepe filled with eggs, scallions, and other savory ingredients and heavily doused in oil. Nevertheless, I love it so much that there is no guilt in this pleasure of mine. I’ve grown up with it and cannot resist it. And judging by its ubiquity all throughout Indonesia, I am not alone. Plus, as long as there are people like the ones in Epic Meal Time to compare to, I don’t feel so bad indulging in a couple pieces at a time. 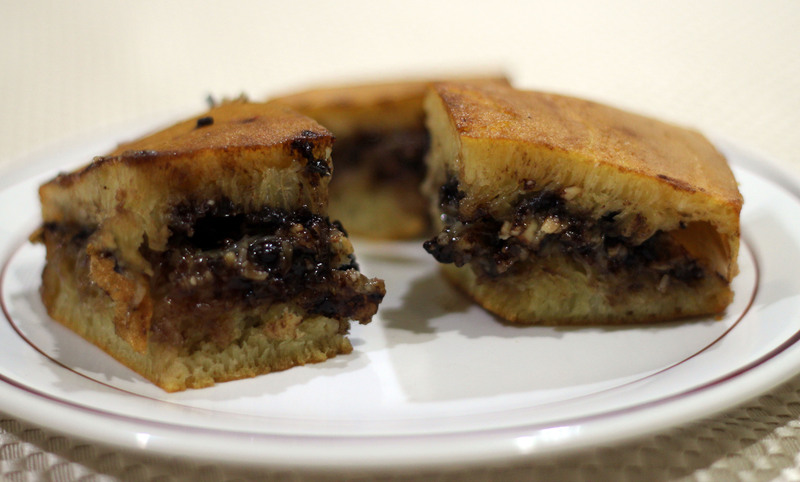 Each portion of terang bulan in Bali typically contains about 8 slider-sized pieces whereas the martabak manis in Jakarta contains double of that. In Jakarta there are many established chains that operate multiple stalls around the city, but I don’t see this at all in Bali; seems like every terang bulan vendor here operates independently of each other without ever taking that next step of establishing a brand. So even though I highly recommend the Martabak Top Bandung chain in Jakarta out of the plenty that I’ve tried, I don’t have enough knowledge or experience to make one stellar recommendation in Bali—though I will say that the one near my house on Jl. Raya Lungsiakan is pretty darn similar to the Martabak Top Bandung chain. 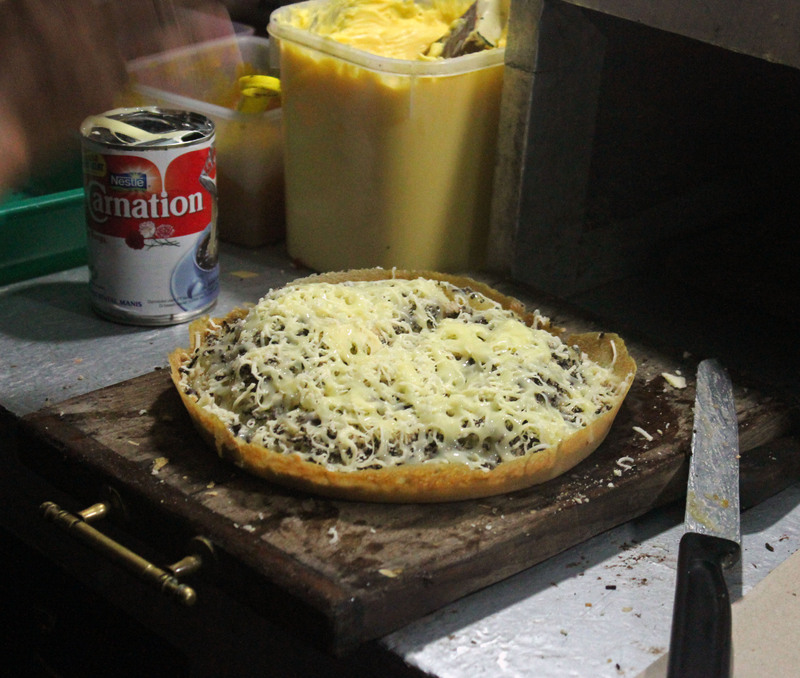 This entry was posted in Bali, Taste and tagged late night foods, martabak manis, terang bulan. Hi Cindy, for good Terang Bulan in Denpasar, my favourite is Holland’s at Jalan Teuku Umar (http://j.mp/wgIKZr). This is the closest to Bandung’s style as far as I know, and as expensive as well :D.
The one in Libby Plaza (http://j.mp/y4WY1P), also on the same street but further north east, looks quite famous as well; while the one in Jalan Letda Tantular always packed with buyers (http://j.mp/wUyUVp) however I got a bit repelled by it’s name “Sabar Menanti” (awaiting patiently). Wow thanks! Unfortunately, I rarely make it down to Denpasar, but will definitely keep those places in mind. I wonder what it would taste like…chocolate and cheese? Let me try when I go to Indonesia next time!